We carry a huge selection of VW Engine Cooling Tin in chrome or black finish for your air-cooled Volkswagen Bug, Super Beetle, Karmann Ghia, Bus, Type 3, or Thing. 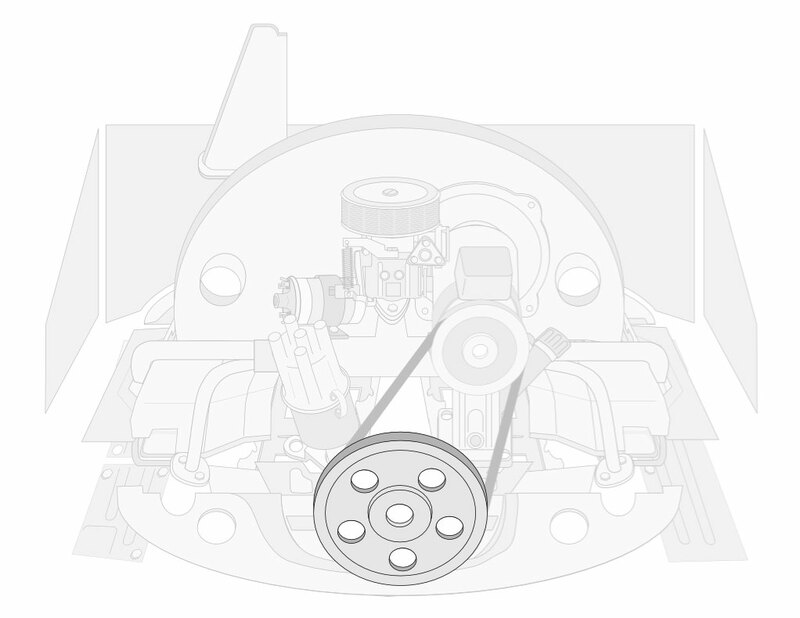 Our Volkswagen Engine Tin serves to keep your VW engine cool by directing air from the top portion of the engine compartment through the oil cooler, cylinder heads and cylinders. It keeps that same hot air from re-entering the engine compartment which would increase the engine's temperature. Our Black Engine Tin offers maximum cooling because the black paint disperses the heat the most efficiently. Our Chrome Engine Tin works to cool the engine and gives it a customized look that will stand out. 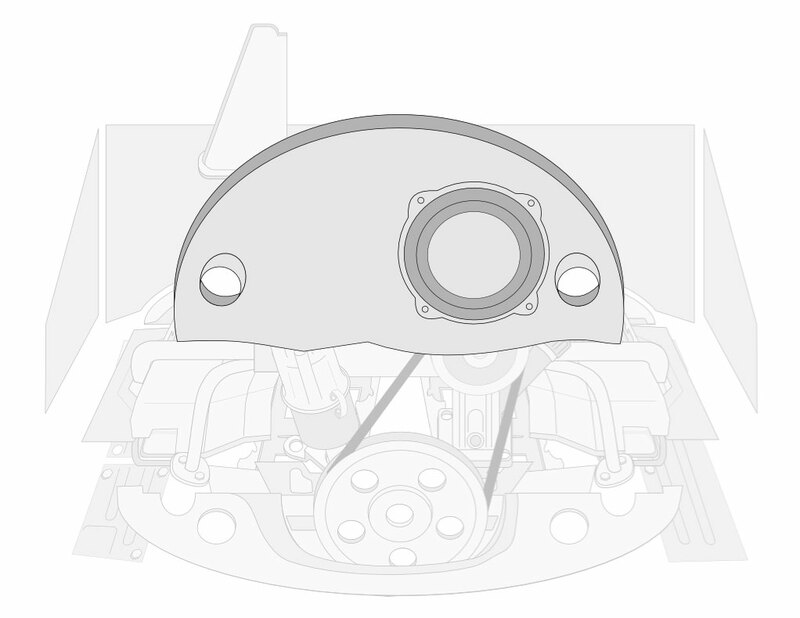 Our Chrome VW Engine Parts include Fan Shrouds, Cylinder Tin, Breast Plates, Pulleys, and Firewalls. VW Alternator / Generator Stands and Straps. VW Engine Tin and Chrome Dress-Up Kits. VW purposely painted the engine tin black to aid in cooling. The black paint disperses the heat better than other colors and finishes. Click Name to view more information. 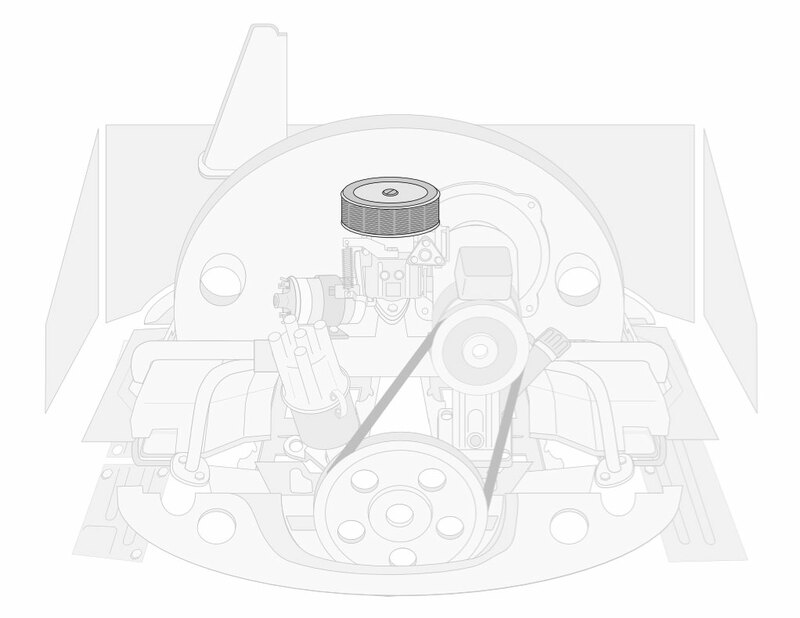 Upright Oil Cooler: Stock oil cooler used by VW up to 1970. This oil cooler sits in-line with the fan, inside the fan shroud. 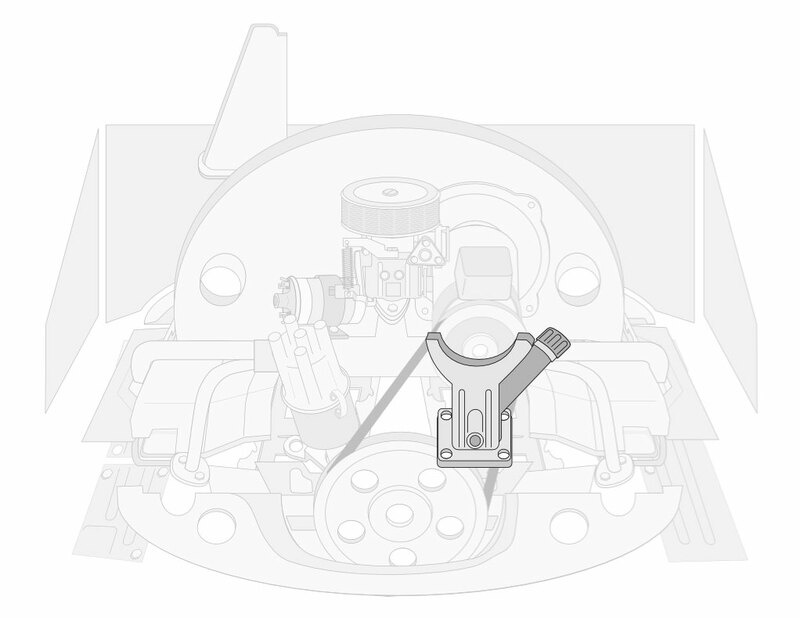 Doghouse Oil Cooler: VW changed to the "doghouse" oil cooler in 1971. 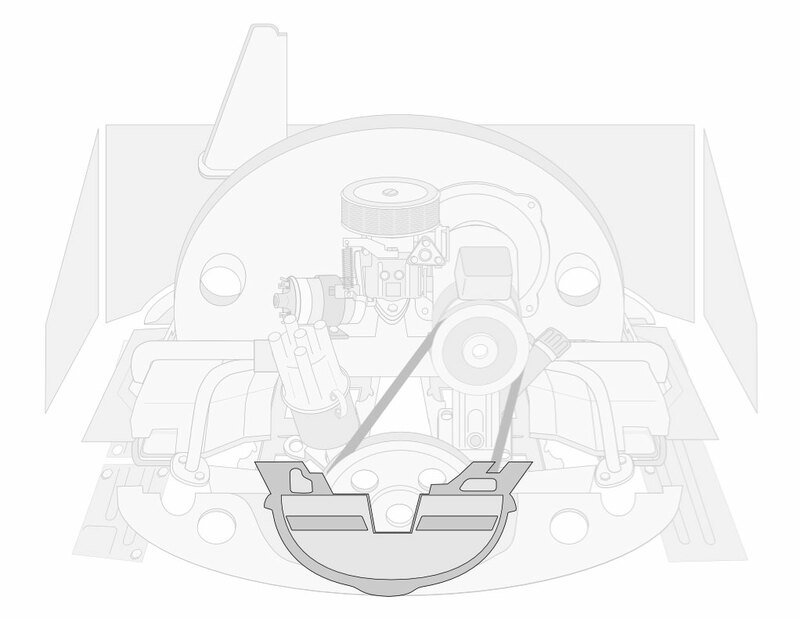 The doghouse oil cooler sits offset from the fan, in a small compartment on the backside of the fan shroud. 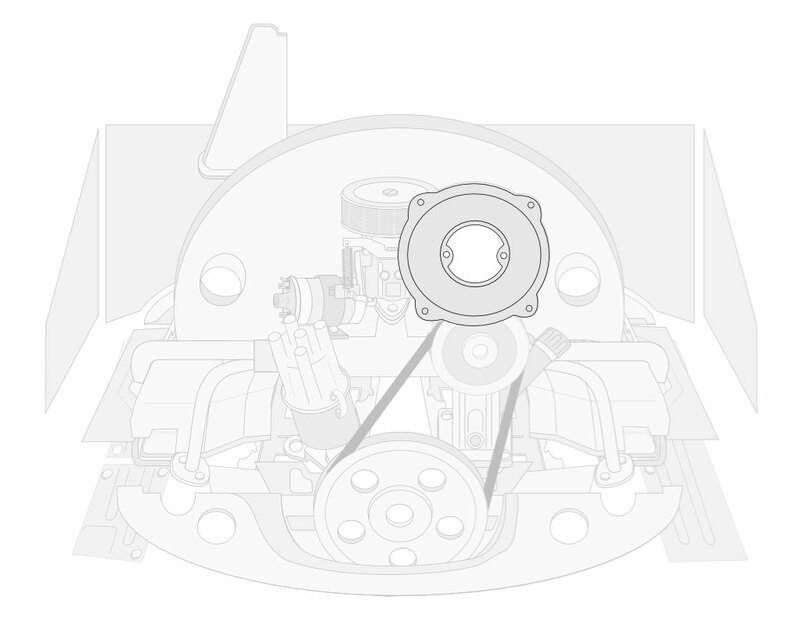 Used only on the doghouse fan shroud, the doghouse tin is a two piece duct that directs the air exiting the fan shroud through the front engine tin, out of the engine compartment. The cylinder shrouds bolt to the cylinder heads, shrouding the heads and cylinders. The cylinder shrouds are offered for the single port heads (used by VW thru 1970) or dual port heads which VW started using in 1971. Original valve covers are a stamped steel cover. They are held in place to the cylinder head with a metal bale. VWs are synonymous with leaking oil and these are one of the main culprits. New valve covers and gaskets might just stop your VW engine from marking its territory. Originally used by VW on Type 3s. VW performance engine builders have been using these on their engines to assist in cooling the cylinders. They are installed BEFORE the cylinder heads are installed. The cooling tin is most commonly held to the cylinders with safety wire. 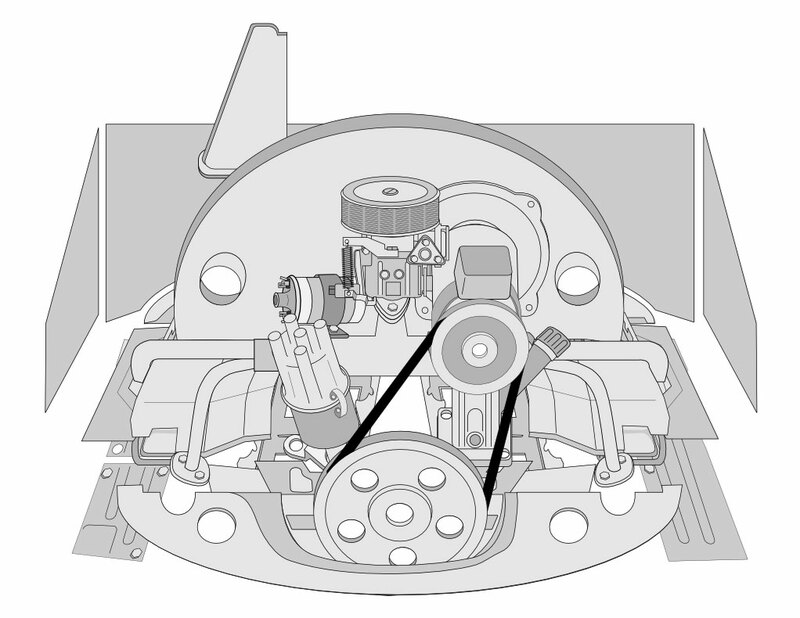 Your alternator or generator is mounted to the engine case on the generator or alternator stand. 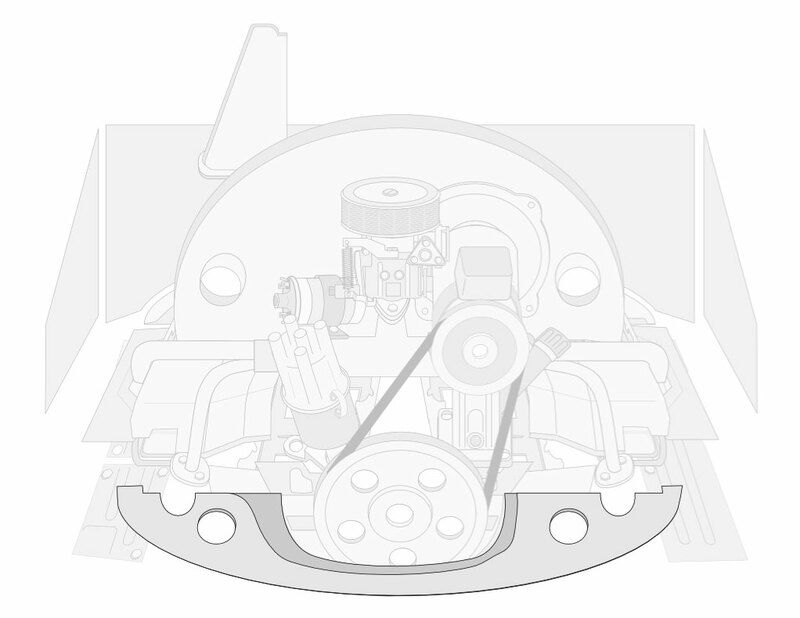 If you are swapping from an original generator you will have to change the stand to the aftermarket stand which is clearanced for the larger front housing of the alternator. 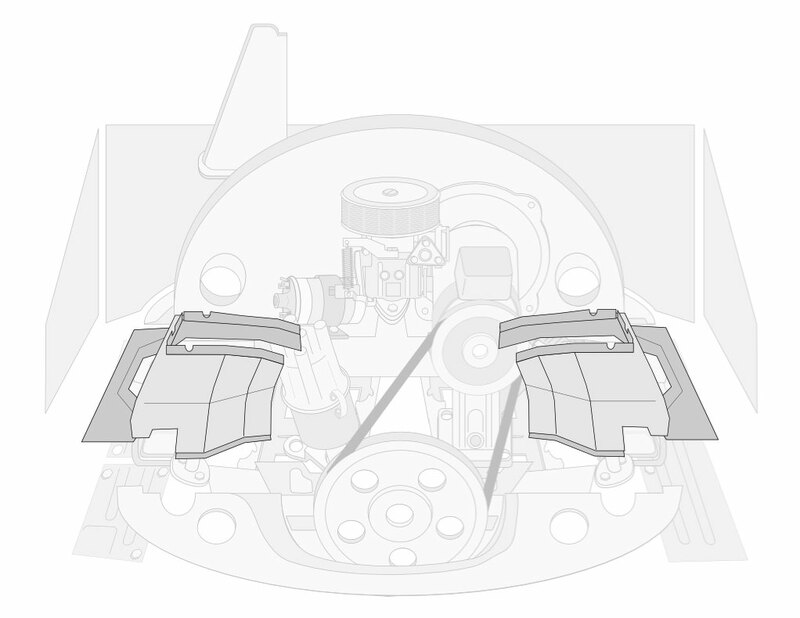 The backing plates are mounted to the back of your generator or alternator and then bolted to the fan shroud. 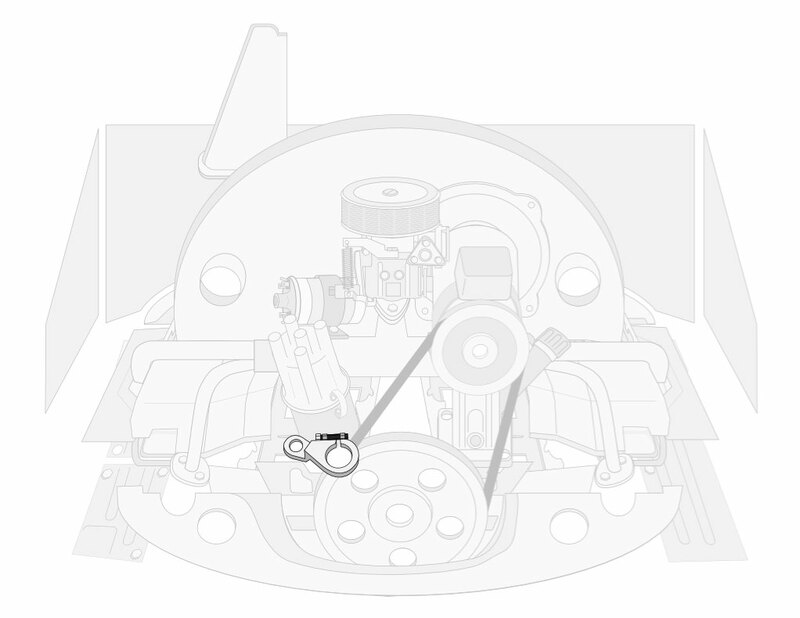 VW generator and alternator pulleys are a two piece unit. 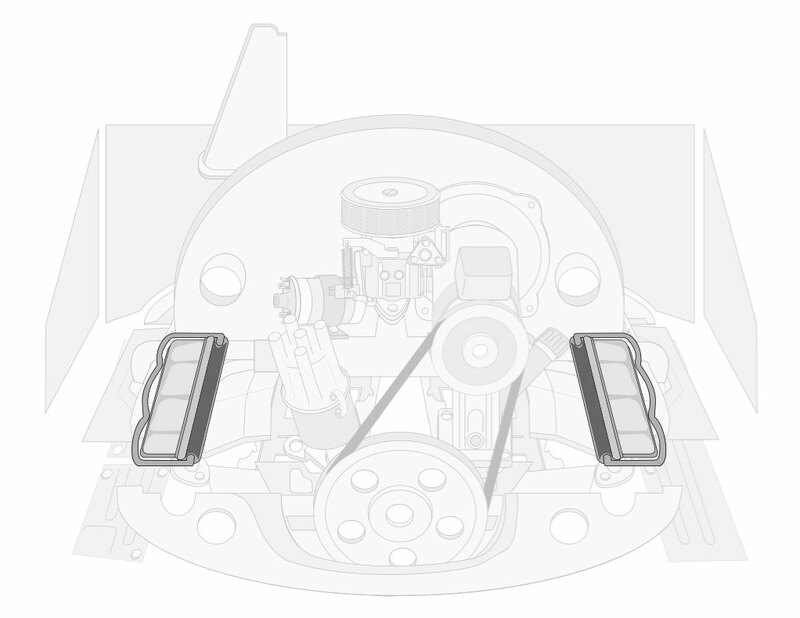 Shims are used in between the pulley halves to tighten or loosen the belt. Less shims between the two pieces tightens the belt, more shims between loosens the belt. Be sure to put the remaining shims on the outside of the pulley before the spacer and nut. The distributor clamp is a simple item but very important. It bolts to the case and keeps the distributor held in place. Ensuring your timing is set properly is essential to keep your engine running well and most importantly cool. VW used an OIL BATH air filter assembly on early models. In the 70s they started using paper filters in a large plastic housing. We offer a number of different style air filter assemblies from paper, to foam and gauze. They come in a numerous diameters and heights. The breast plate bolts to the engine case BEFORE the crank pulley is installed. It bolts to the cylinder shrouds and rear engine tin on either side. 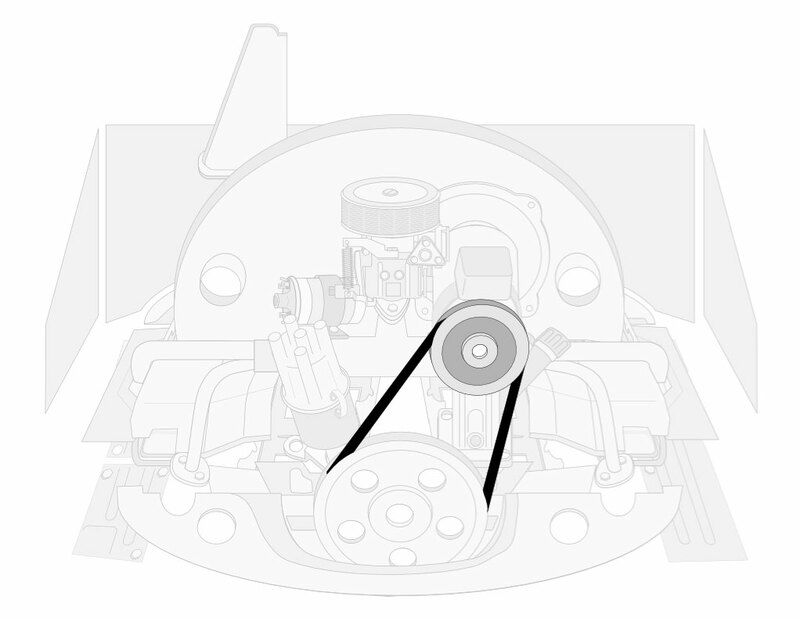 The lower drive pulley on the engine, attached directly to the engine crank shaft. We offer the pulley in a variety of different styles and sizes from stock to chrome, in steel or aluminum. The rear engine tin is actually the first piece of tin you see looking at the engine from the rear of the car. Named rear because it is at the rear of the car, this is a very important piece of tin. It sits above the muffler or exhaust header and keeps that heat from entering back into the engine compartment. 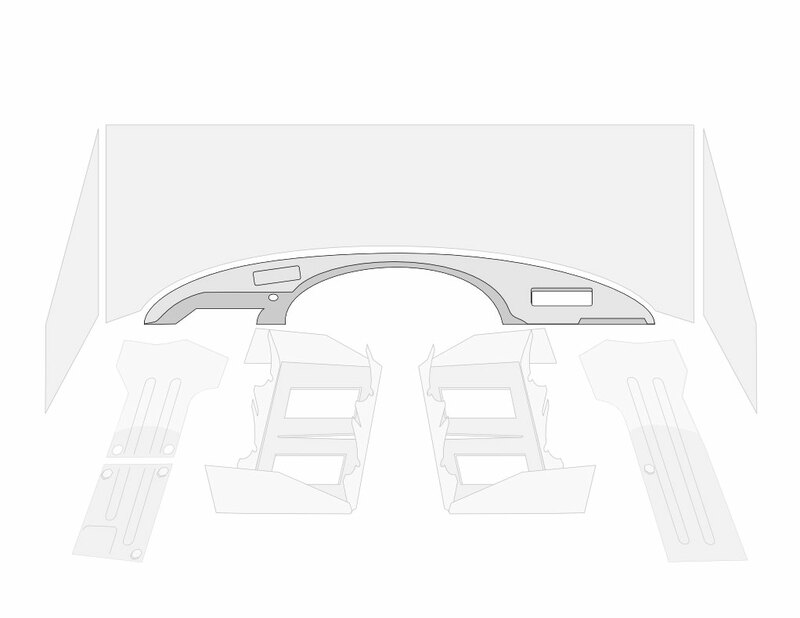 The firewall from VW is a tarboard which helps in sound deadening and heat insulation. We offer stainless steel or aluminum decorative pieces that help dress up the appearance of the engine compartment. Be sure to install a sound deadener such as the tarboard before installing an aftermarket firewall. Used in conjunction with factory heater boxes. 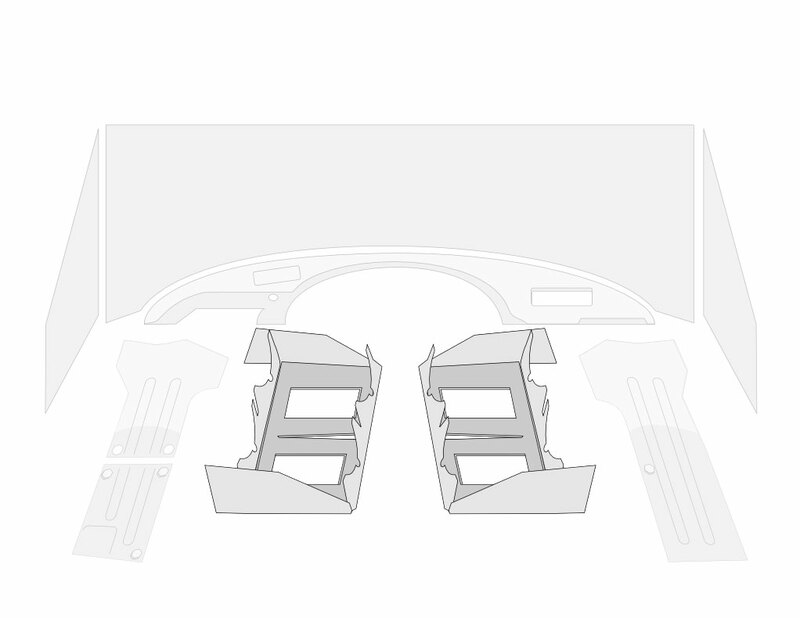 These help direct air on the bottom side of the engine. 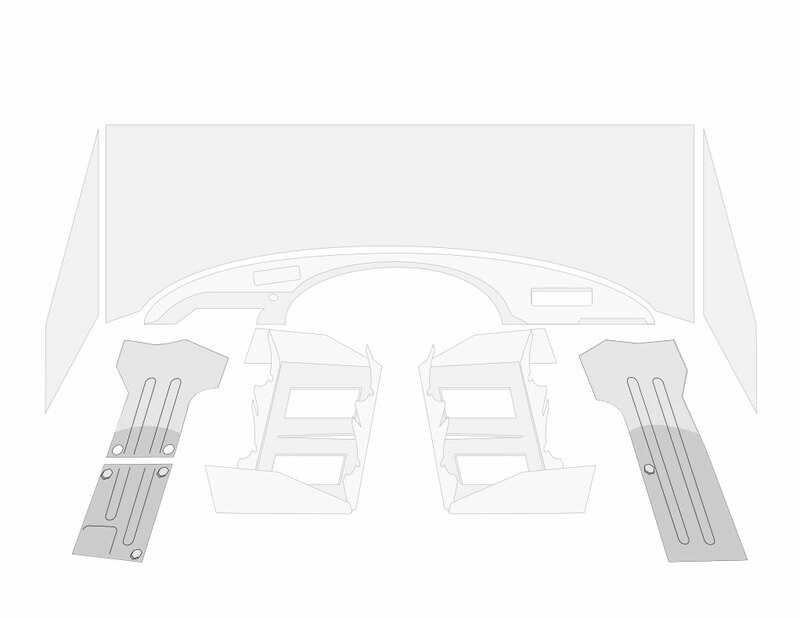 They bolt to the bottom side of the cylinder shrouds, the engine case and the heater boxes. 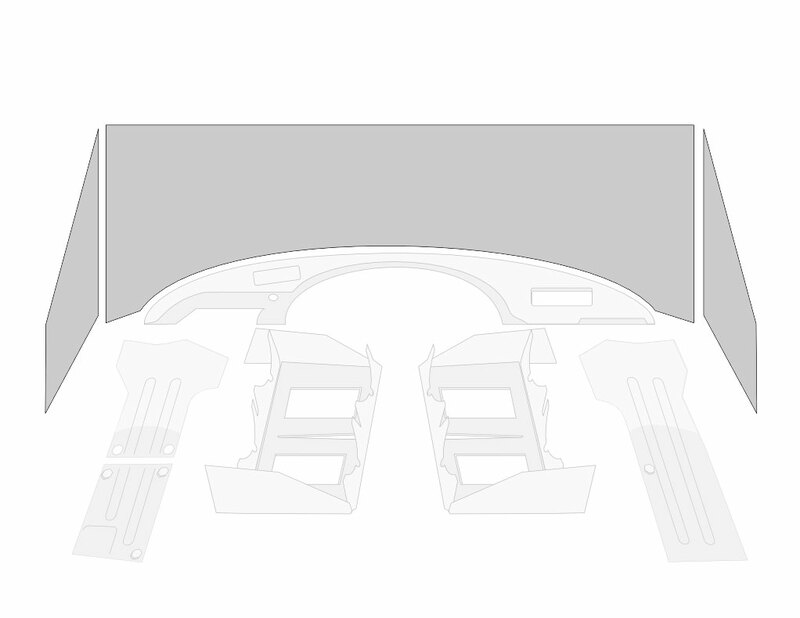 The front engine tin is located below the firewall. 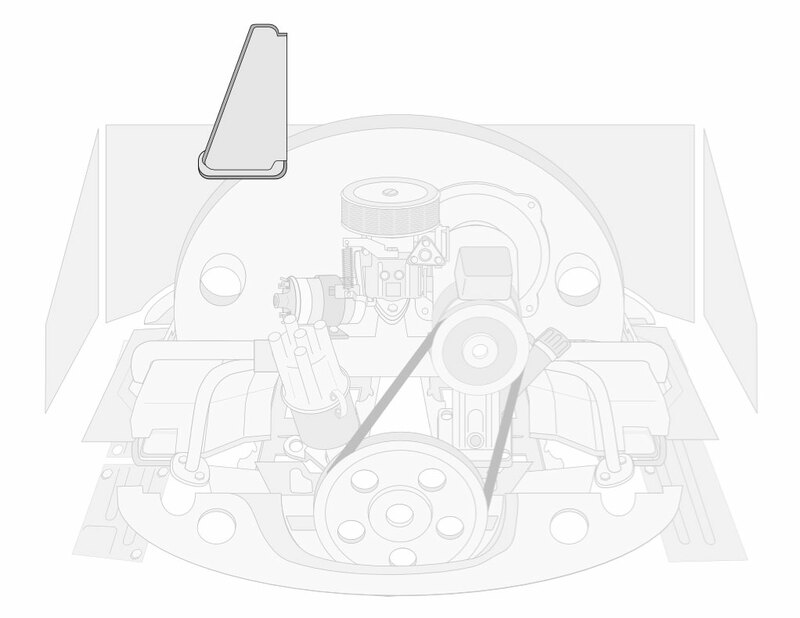 It is bolted to the left and right cylinder shrouds and seals off the engine compartment behind the fan shroud. Your throttle cable and fuel line pass through this tin coming from underneath the car, into the engine compartment. The late model doghouse tin has an opening for the doghouse fan tin to exit through.